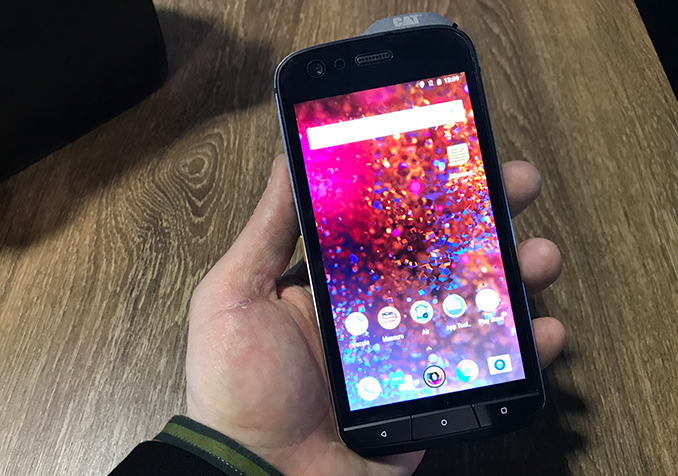 Earlier this month Bullitt Group and Cat introduced the new Cat S61 ruggedized smartphone for workers and first responders who have to operate in harsh environments. 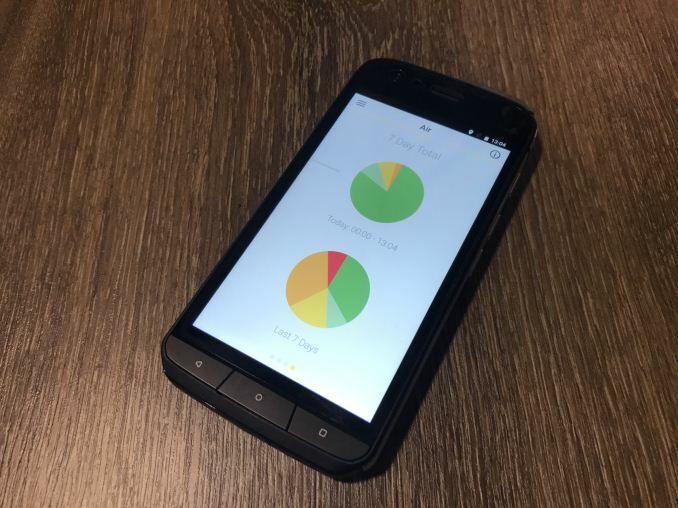 These 'ruggedized phones' have to be able to work in areas such as industrial sites, disasters, or conflict zones, and also require special features to assist the users. The phone was being displayed at Mobile World Congress last week, and since this is the first handset to be outfitted the combination of a FLIR thermal camera, a laser-assisted distance meter, and an air quality analyzer, I could not miss an opportunity to check it out in real life. 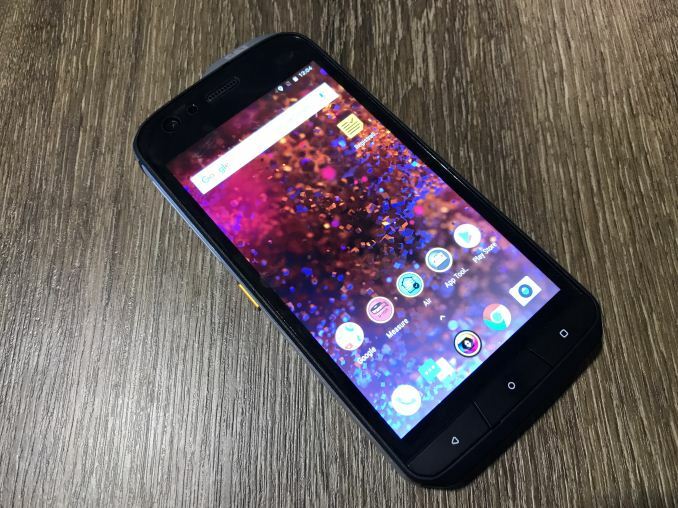 The mighty IP68-rated waterproof Cat S61 looks solid on pictures, and in person it feels just the same: a very robustly made smartphone that is reinforced all around. 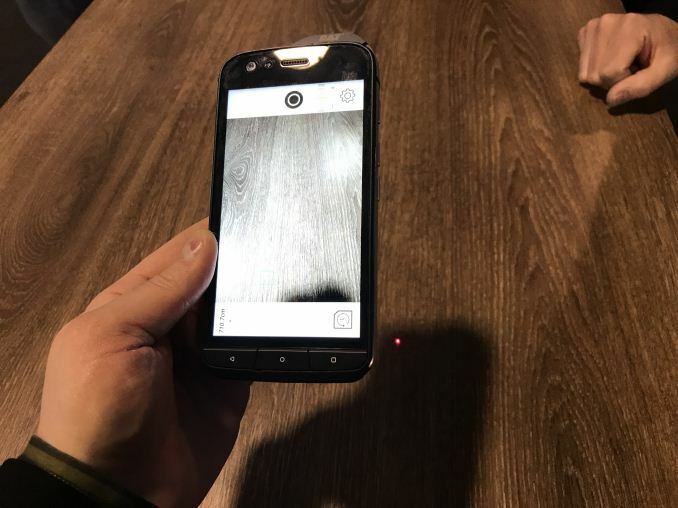 The phone has sharp edges, and the surface on the back is knobby, this was done intentionally to enable people wearing gloves to hold the handset firmly. 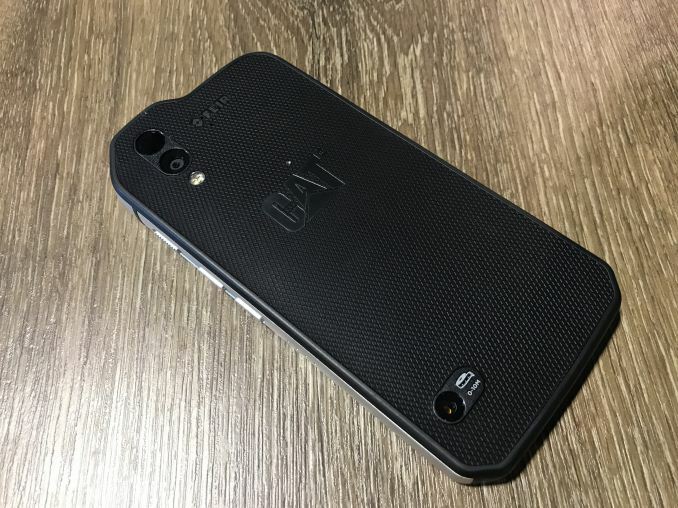 For the very same reason, the Cat S61 has hardware keys for Android UI: it is much easier to press them rather than trying to touch software/sensor buttons. 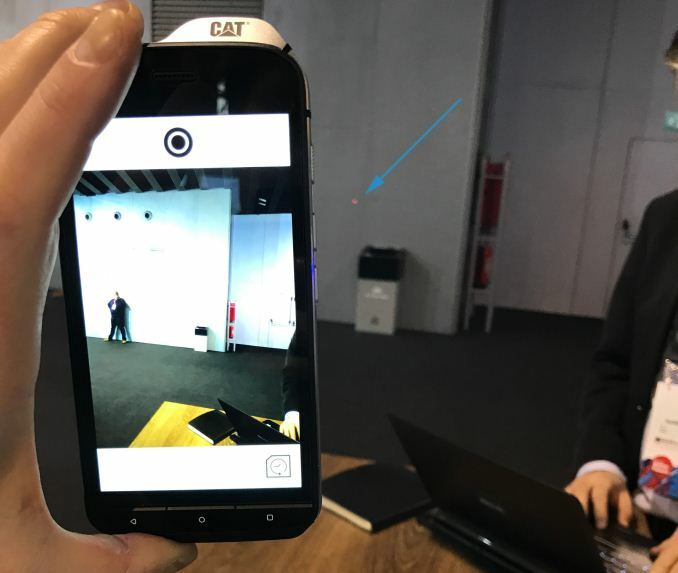 One of the key features of the Cat S61 is of course the FLIR thermal imaging camera. 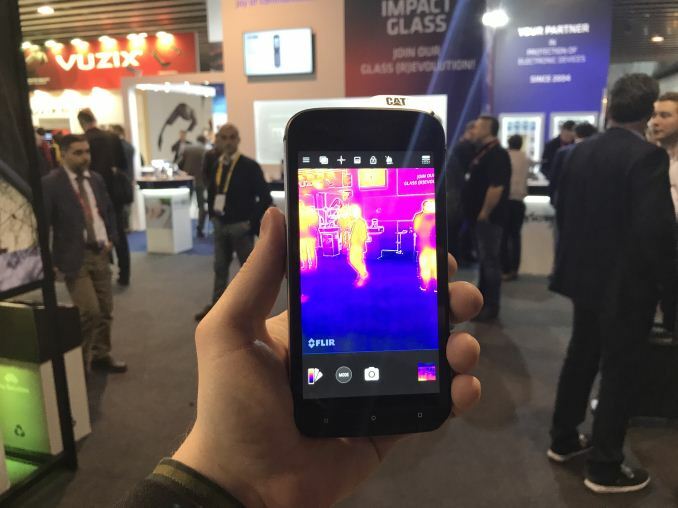 The Lepton sensor used by the S61 is the same as used by the S60, but Bullitt/Cat equipped it with a new software and therefore enhanced its temperature range up to 400°C. 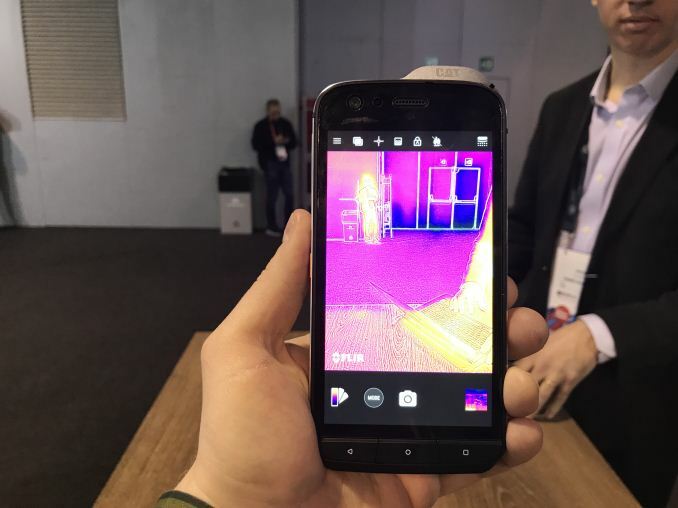 There are obviously no sources of such extreme heat on a show floor, but I can confirm that the sensor works just like it is intended to. The FLIR sensor is located on the upper side of the phone, just above the regular camera, so using it is rather comfortable. Since this was my first experience with a thermal camera, it was mostly fun, yet consider how useful this device is for construction workers, electricians and others. Next up is laser-assisted distance measurer. This one works quite well too; it has a maximum distance of 10 meters, and a precision is up to one millimeter. 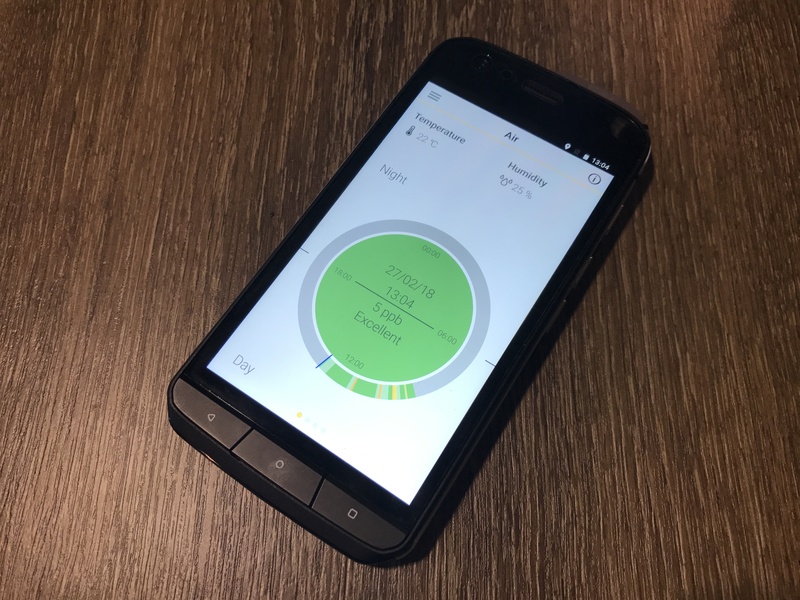 The biggest problem with the measurer is that it is located on the bottom of the phone and it is not very comfortable to use it as it gets blocked by either your hand or fingers. Holding the Cat S61 using only two fingers is not very comfortable and something tells me that holding it this way wearing gloves will be quite disappointing (keep in mind that you should not block the display while using the measurer). Perhaps installing another sensor into the upper part of the phone was not possible because it is pretty heavily packed with antenna, camera, thermal sensor, flash, etc. 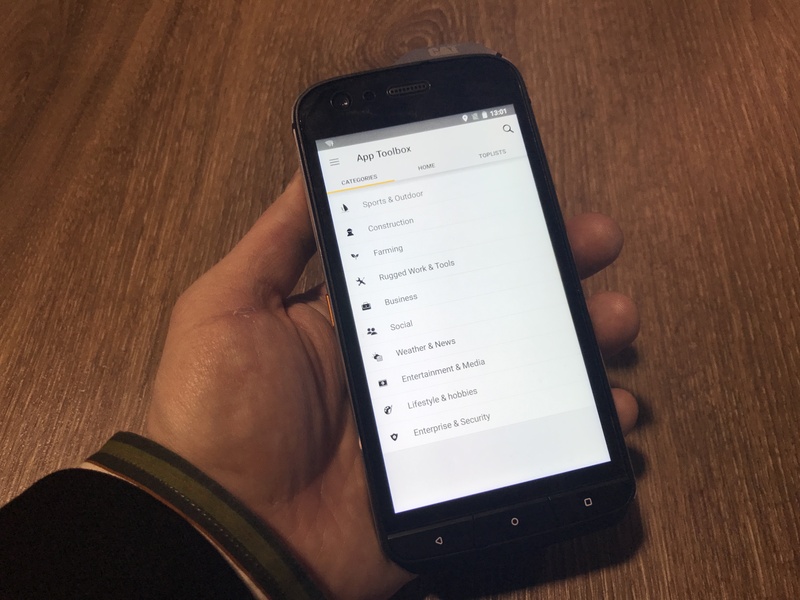 However, its current location makes the thing rather difficult to use, at least when holding the smartphone vertically. 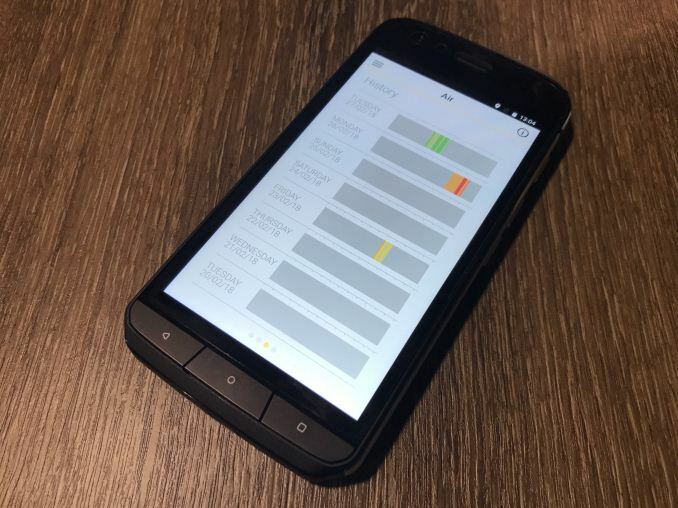 The third key feature of the Cat S61 is its indoor air quality sensor from Sensirion that can detect indoor air pollutants (Volatile Organic Compounds or VOCs) and notify users when an unhealthy environment is detected. 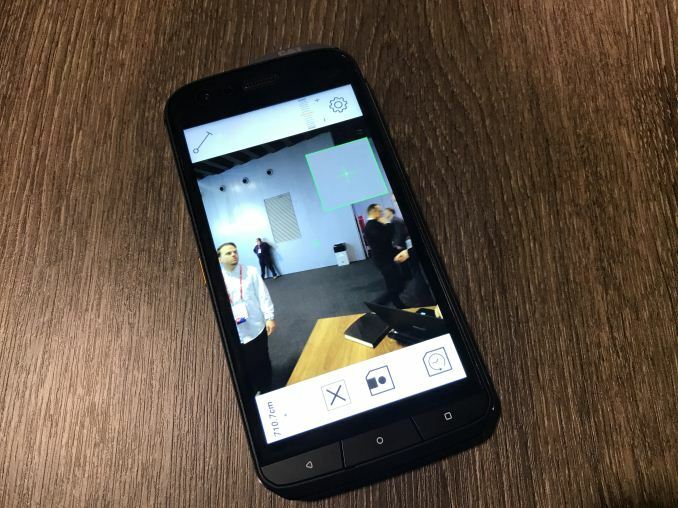 We clearly did not have any VOCs at Bullitt’s MWC booth, so the sensor could not detect anything harmful. However, it did show that the air quality was good. 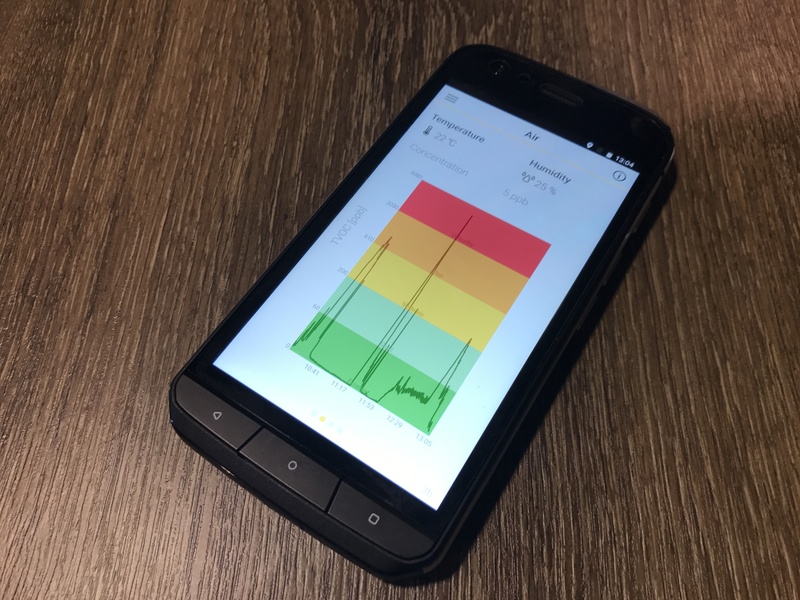 Besides, the software that Bullitt supplies with the phone keeps historical tabs on the measurements, which is quite handy for those who use the S61 regularly to detect VOCs. 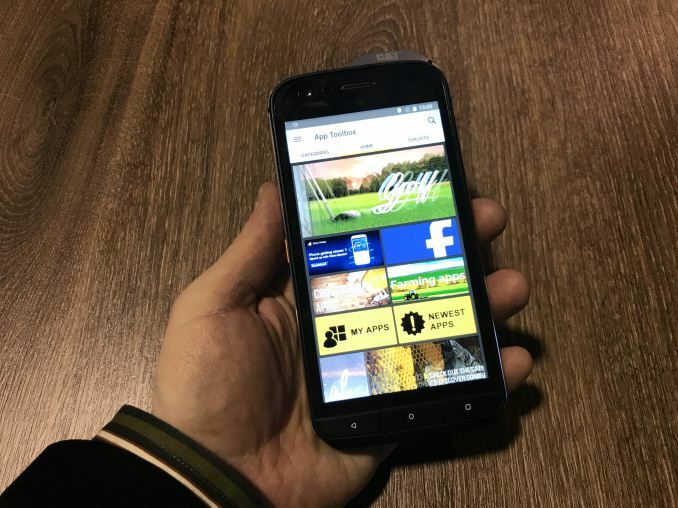 Last but not least, it is worth mentioning that Bullitt supplies its specially crafted App Toolbox with its Cat and Land Rover-branded smartphones. The toolbox contains a selection of programs for different activities, including construction, farming, rugged works and so on. This catalogue greatly simplifies when finding the right specialized apps. Since not many programs can use Cat S61’s sensors as yet, organizations planning to deploy the smartphone for their operations might want to design their own custom software for automotization of their processes. The big bezels are for extra drop protection. From coverage elsewhere this's built to take a 5 or 6 foot fall on concrete vs the 3 feet for a more conventional design. A construction site's also going to have a lot more opportunities to bang against something hard than your office will. It's for work, not for showing off.